Gold usually gets all the headlines when it comes to precious metals, leaving silver looking like the unloved stepchild. Highlighting this fact today is that the spread between the price of gold and silver, known as the gold-to-silver ratio, is near the highest point it's been in at least the last 20 years. But here's the interesting thing: When the differential between these precious metals gets wide, the ratio often narrows because of a silver rally. 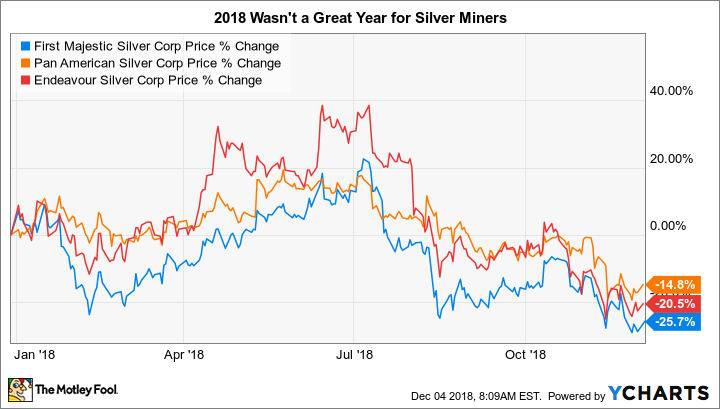 If that sounds interesting to you but you don't want to own either of the metals, than consider looking at silver-focused miners like First Majestic Silver Corp. (NYSE:AG), Pan American Silver Corp. (NASDAQ:PAAS), and Endeavour Silver Corp. (NYSE:EXK). Each of these should benefit from a rise in silver prices. One of the problems with finding a silver miner today is that many one-time silver miners are actively shifting their focus toward gold. That trend, however, doesn't include First Majestic, which proudly uses the tagline "One metal, one country." The country is Mexico, where all of the company's mines are located, but the one metal isn't exactly true. Mines usually contain more than one commodity, and precious metals are no different. That said, First Majestic's focus is definitely silver, which makes up around 60% of revenues. The miner has six operating mines today, all of which it owns. The latest addition to this list is the San Dimas mine (added in May of 2018), which has pushed First Majestic's production higher for the first time in several years -- and in a big way, with silver equivalent ounce production growth of more than 30% in the second and third quarters. Looking further out, the miner has another three development projects in the works (and an exploration phase asset) that should support long-term production growth. The only problem here is costs. First Majestic's all-in sustaining costs in 2018 are expected to be between $14.53 per ounce and $15.83 per ounce. Although that figure is elevated by the company's development projects -- cash costs are expected to be in the mid-$7-an-ounce range, silver is currently trading at around $14.50 an ounce. The company isn't profitable. However, it has a modest amount of long-term debt (about 15% of the capital structure) and should be able to handle its investment plans. If silver prices rise, meanwhile, it would quickly break into the black. Pan American Silver bills itself as the world's second-largest primary silver producer. Silver, however, only makes up around 45% of revenues, with the rest coming from gold (26%) and other metals. Like First Majestic, however, silver is the company's core focus. Pan American has mine investments spread across North and South America, with a total of six operating mines and six mines is some stage of development. Those development mines are expected to shift Pan American's production higher in the next few years after a period of stagnant growth. 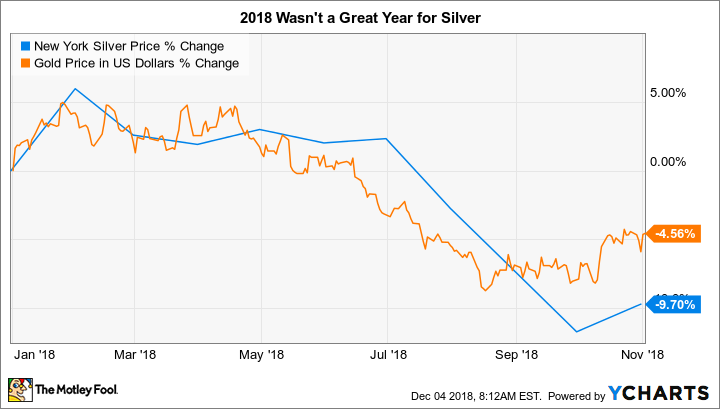 The improvement is already starting to show up, with silver and gold production up year over year in the third quarter of 2018. Moreover, its all-in sustaining costs are fairly low, with a target at around $10 per silver equivalent ounce. Through the first nine months of 2018, the figure is running a little below that target. That said, in mid-November, Pan American agreed to acquire Tahoe Resources (NYSE:TAHO). It's a complex deal with an initial payment and a contingent payment possibly to follow when Tahoe's Escobal mine is up and running. That was one of the key assets that Pan American was looking to add to its portfolio, but Tahoe also brings along with it additional expansion and development opportunities. The deal isn't done yet, but Pan American expects to be the largest publicly traded silver miner following completion of the deal. Pan American was profitable in 2016 and 2017, and based on solid results through the first three quarters of the year, it looks like it will be profitable again in 2018. That said, the Tahoe acquisition will lead to some near-term volatility in the company's financial results. But Pan American could be an interesting option for silver investors willing to monitor acquisition progress, as the end result will be Pan American gaining further scale in the silver space. Endeavour Silver has four operating mines located in Mexico, one development project, and four additional exploration efforts underway. Like the miners above, silver equivalent production growth had been falling for a few years, peaking in 2013 and hitting bottom in 2017. That trend is projected to change in 2018, with acquisitions and development pushing production higher for the first time in years. Silver equivalent ounce production was up 12% year over year through the first nine months of 2018. About 60% of the company's revenues are derived from silver, with the rest coming from gold. The one notable problem here is costs, with all-in sustaining costs of $15.87 in the third quarter of 2018. Simply put, with silver prices where they are today, Endeavour isn't making money. Some of that is related to development costs, but at this point, the silver miner needs higher silver prices to turn a profit right now. That said, Endeavour's balance sheet is squeaky clean, with zero long-term debt. There's no reason to believe that it can't continue to sustain itself through the current market environment and support its expansion efforts. And if silver prices head higher as silver production expands, investors are likely to reward Endeavour shares with notable gains as it shifts from red ink to black. While there's no such thing as a pure-play silver miner since silver and gold are often found together in the ground, First Majestic, Pan American, and Endeavour all are clearly focused on the metal. The stories are a little different in each case, but all offer material exposure to silver and an opportunity to benefit in 2019 if silver prices start to move higher. If you're looking for silver mining stocks, this trio should be toward the top of your list.